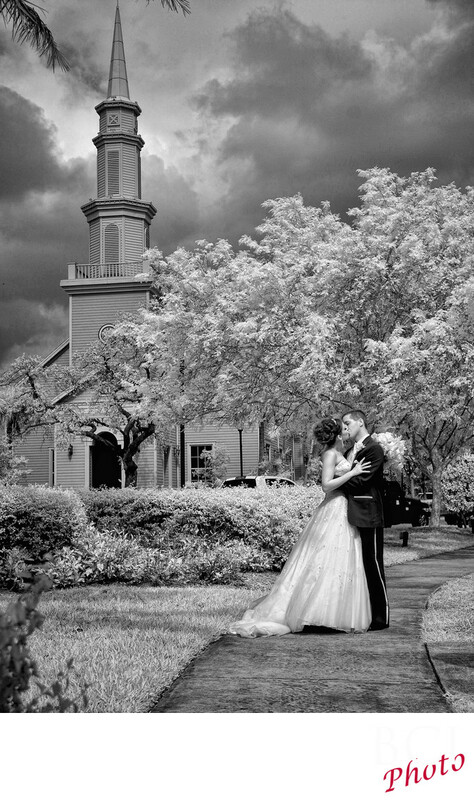 Infrared photograph taken at a wedding at Tradition Town Hall in Pt St Lucie, Florida. here this black and white rendition of an infrared wedding image shows off the cloud formations and leaf details as only infrared can capture. As the pioneer in the use of infrared photography for weddings, we do this at all outdoor events. infrared can be done in black and white, chocolate, blueberry or strawberry as well as colorized versions where the sky remains its natural blue color as the leaves become yellow or white. Many of our brides select their wedding album cover shots from our infrared wedding collection, or use them as wedding thank you cards. The striking and unique appearance of infrared wedding images really has a huge wow factor and is something unique to us.